The UC Santa Cruz community is invited to join in the dedication and celebration of Rachel Carson College at noon Thursday in the college’s plaza (PDF map). During the ceremony, campus leaders will reflect on Rachel Carson and the history of the college. The hand-carved wood sign at the college’s entrance will be unveiled. Light refreshments will be served. Speakers include Chancellor George Blumenthal, Rachel Carson College Provost Ronnie Lipschutz, and Senator Bill Monning, D-Carmel. Later in the day, biographer William Souder, author of On a Farther Shore, will give a talk on Rachel Carson’s legacy. Souder will speak at 5 p.m. in the Music Recital Hall. The event is free and open to the public, though registration is requested. Carson, a writer and conservationist, is widely credited with launching the modern environmental movement. 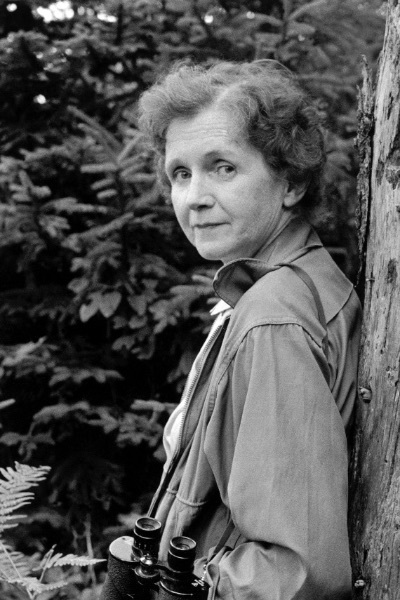 Her 1962 book, Silent Spring, dramatically chronicled the damage caused by indiscriminate application of chemicals in an attempt to control pests. Her larger theme: humans are a part of nature—not its masters. The naming gift from the Helen and Will Webster Foundation recognizes Carson for her courage and pivotal role in awakening the public to environmental issues. It establishes an endowment to ensure the college can provide research and educational opportunities for students in perpetuity and establishes a chair in ecology and environmental justice. Concurrently, citing the impact of Carson’s writings, a chair in science communication is also being created. The gift package totals $7 million. If you have questions about these events, please contact the Special Events Office, specialevents@ucsc.edu or (831) 459–5003.